The benefits of bilberries are well documented and written about in Bilberry & Lutein: The Vision Enhancers! Protect Against Cataracts, Macular Degeneration, Glaucoma, Retinopathy. Bilberry is also known as the European blueberry and in the U.S. it is called the huckleberry. They are mostly found in northern Europe. The scientific name is vaccinium myrtillus. Bilberries grow from a perennial shrub that grows to only about 16 inches high and produces dark purple berries in late summer. In the U.S. they are called huckleberries. The fruit and the leaves have been used for medicinal purposes for many years in different cultures. It is difficult to get fresh bilberries in the U. S., but we can look at supplementing with bilberry tea, jam, extracts or capsules. These berries have historically been used to help improve night vision, treat diarrhea, improve blood sugar levels in diabetics, strengthen blood vessels and improve circulation. As a cousin to the North American blueberry, it is packed full of a powerful antioxidant called anthocyanidins - known to protect the lens and the retina from the damages caused by free radicals. Anthocyanosides are plant pigments that provide antioxidant protection. Antioxidants act as scavengers who de-activate free radicals that are known to play a role in the development of diseases like cancer or macular degeneration. These berries are high in flavonoids, which are found in many other fruits and vegetables. Flavonoids have antioxidant properties which protect cells in the body and cell membranes from the damaging effects of free radicals. They are also known to benefit the eyes and the circulatory system. The flavonoid, anthocyanididins, found in this antioxidant fruit provides the blue color of the berry and is the main active ingredient of this plant. to the tiny blood vessels that keep eyes healthy, as well as helping to maintain good circulation. The dark blue skin of the berry which contains anthocyanins may increase the retinal pigment. Plant pigments, like anthocyanins have excellent antioxidant properties. Antioxidants act as scavengers to neutralize free radicals which cause damage to our cells and especially to the macula. Antioxidants have been shown to help prevent many degenerative diseases such as macular degeneration. eyes. Bilberry for eyes and eye health has been associated for many years, but especially after British WW II pilots reported better night vision after eating bilberry jam. In the North American blueberry, the pigment is only found in the skin. This European blueberry may affect blood platelet stickiness so talk to your doctor if you are taking any anti-coagulation medication. Bilberry also contains another powerful antioxidant, vitamin C as well as vitamin A, catechol tannins, and hydroquinone. If you'd like to learn more about bilberry benefits, an excellent little book is Bilberry and Lutein by Beth M. Ley, Ph.D. She talks about the bilberry health benefits for the eyes, diabetes, and heart disease. Often you will find eye supplements or vitamins for macular degeneration include the carotenoid, lutein, with the bilberry. High concentrations of this antioxidant are in the macular pigment. The macular pigment is known to provide protection against macular degeneration and cataracts. If you are looking for vitamins for eyes that include natural sources of bilberry and lutein consider the eye supplement formula that we take from Natural Eye Care. 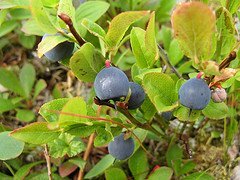 For those of us in the US it is not easy to get fresh bilberries, but we can get some of the benefits of these berries from billberry tea, jam or supplements. Bilberry is a common ingredient in many vitamins for eyes. Often it is easier to get the nutritional benefits of bilberry from eye supplements or vitamins for eyes. Many vitamins for eyes contain this antioxidant rich berry along with other natural nutrients such as lutein and zeaxanthin. According to Dr. Marc Grossman, O.D., L.Ac., optometrist and licensed acupuncturist, "Bilberry improves circulation in the blood vessels of the eye, helps maintain the integrity of capillaries, stabilizes collagen, and stimulates the production of rhodopsin essential for night vision." He also states that it is a myth that nothing can be done to improve your eyesight, but rather through proper diet, lifestyle and supplements you can have a positive impact on your vision. The tannins in this fruit when it is dried act as an astringent. This affects the gastrointestinal tract by shrinking and tightening the mucous membrane and helps to relieve the irritation. 3) Powerful antioxidant - they contain high amounts of flavanoids called anthocyanosides which prevents the damaging effects of free radicals that cause aging, inflammation, cancer and degenerative disorders like macular degeneration. Bilberry and Lutein, The Vision Enhancers, by Beth Beth M. Ley, Ph.D. It is well researched and just may convince you as it did me, the need to protect our eyes with these supplements. 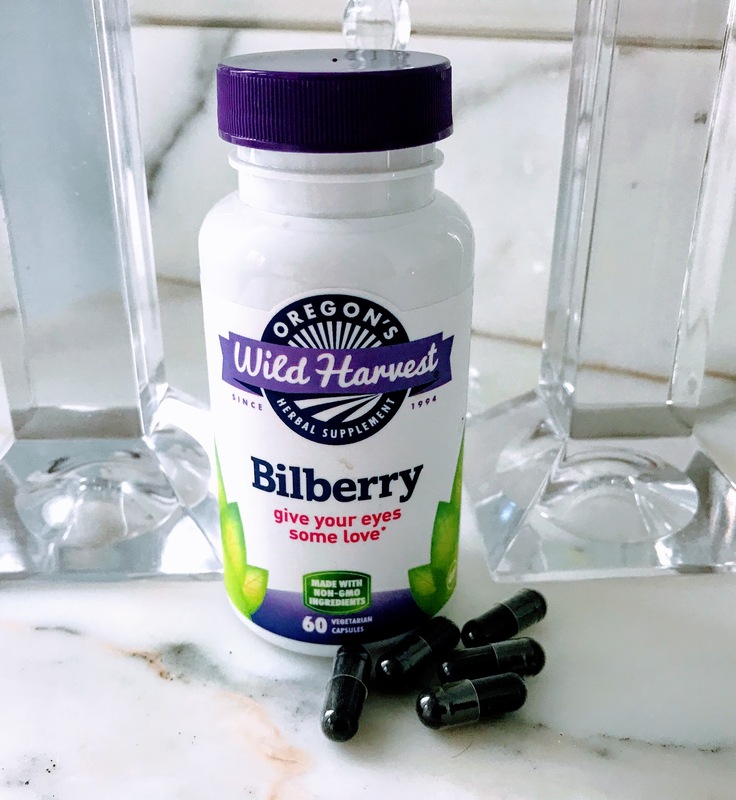 The eye vitamin that my husband and I take includes European bilberry as well as other powerful macular degeneration antioxidants like lutein and zeaxanthin - all from natural sources. Anthocyanins also strengthen blood vessels and improve circulation. How does that help the macula? What is bilberry used for when it comes to the macula? Macular degeneration is the result of problems with the delivery of nutrients and oxygen to the macula and the subsequent removal of waste products. Anytime circulation is improved in the body, the eye benefits as well. Better circulation to the macula means more nutrients and oxygen and less toxic build up. According to the National Center for Complementary and Alternative Medicine: "Bilberry fruit is considered safe. However, high doses of bilberry leaf or leaf extract are considered unsafe due to possible toxic side effects." It is always a good idea to inform your doctor about any herbs, supplements or alternative medicine that you are taking. "Bilberry is generally believed to be safe in recommended doses for short periods of time, based on its history as a foodstuff. There is a lack of known reports of serious toxicity or side effects, although if taken in large doses, there is an increased risk of bleeding, upset stomach, or hydroquinone poisoning." This jam is best known by the stories of World War II British Royal Airforce fighter pilots who said their nighttime vision improved after eating jam made from this berry. However, in reality, not many studies have been done on the effects of this fruit. Most of the studies have not been in humans but rather in animals and test tubes. Besides eaten fresh, the berries are often used to make jam. The jam cannot be easily found in grocery stores in the U.S.